A 30x30 multiplication chart provides a great way to start exploring patterns in the times table that extend past your basic 1-12 or even 1-15 facts. This printable PDF is a great tool for middle-school students who are ready to expand their multiplication skills. 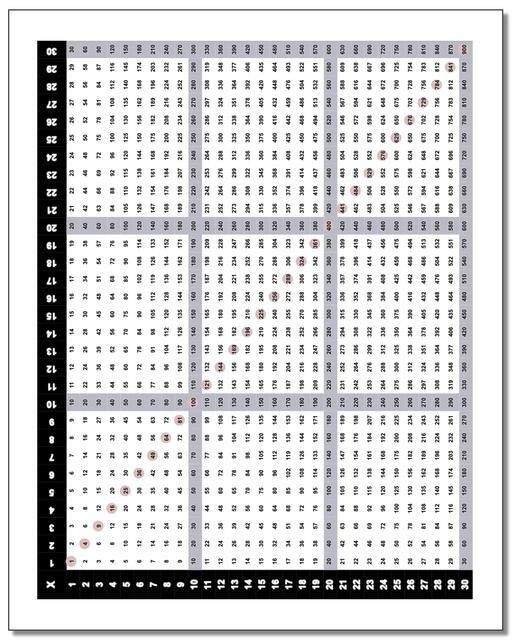 Mine the Depths of the Multiplication Table with this 30x30 Chart! This chart provides a ready way to look at multiplication fact families over a larger range of products compared to the usual 1-12 or 1-15 charts we use to learn the times table. This 1-30 chart also highlights the perfect multiplication squares, which is helpful when navigating a number chart of this magnitude. Seeing how multiplication products change within a series of problems across larger ranges of numbers can develop a number sense in ways that basic times table practice only begins to reveal. Explore the patterns on this multiplication chart, or just use it as a reference when you need to multiply larger numbers.